＊The Japanese edition is here. Eugene Gendlin and Mary Hendriks visited Japan twice, once in 1978 and next in 1987. Long before in 1963, Takao Murase visited Gendlin in Madison, Wisconsin and translated his main articles including “A Theory of Personality Change” and published as a book called “Experiencing and Psychotherapy” in 1964, revised in 1966. In 1973, Shoji Murayama visited Gendlin at Chicago University, and introduced Changes Group and Focusing Manuals to Japan. In Japan, in 50s and 60s, Carl Rogers gave enormous influence on psychologists, counselors and therapists all over Japan and eventually people got interested in the new theories and methods by Eugene Gendlin. In 1978, Gendlin was invited as a keynote speaker for the 42 Conference of Japan Psychology Association at Kyushu University and gave workshops in Fukuoka, Kyoto and Tokyo. In 1978, Takeo Tsutsui met Gendlin in Chicago and got permission to translate “Experiencing and the Creation of Meaning” (1963), and the translation came out on 1993. In 1980, Akira Ikemi came back from Chicago finished MA with Gene Gendlin and joined to Kyushu group, where people with Shoji Murayama of Kyushu University began to study and practice Focusing more and more, set up Japan Focusing Society and started a Journal called “Focusing Forum” in 1983. Meanwhile many Focusing networks appeared in many areas in Japan. Gendlin and Mary Hendriks were invited to Japan again in 1987, gave advanced workshops with demonstrations including dream works and open symposium, gave a lot of influence to Focusing in Clinical Practice in Japan. This big project was edited into a book, “Focusing Seminar” by Shoji Murayama in 1991. The first visit by Ann Weiser Cornell was in 1994. Her workshops were planned in different areas in Japan, Kyushu (Fukuoka), Kansai (near Osaka), Tokai (Nagoya) and Tokyo. This made the Focusing map in Japan clearly. Ann Weiser Cornell came to Japan 8 times and gave many workshops in many areas in Japan. We still love her “The Focusing Student’s Manual and Guide’s Manual Third Edition” published in 1993 and translated into Japanese in 1996. Japan Focusing Association was set up in 1997 and we are having annual meetings and Focusers gatherings every year in different areas in Japan. The Focusing journal “The Focuser’s Focus” started in 1998, coming out every 3 months, 4 times a year. In 1998, Gendlin’s third visit was planned, but he couldn’t come because of the car accident and Mary Hendriks came as a substitute for Gendlin for the big conference of The Association of Japanese Clinical Psychology in Nagoya. Here she planned with Shoji Murayama, Takao Murase, Akira Ikemi to appoint new Certifying Coordinators and Trainers from The Focusing Institute. Now we have 1 Honorary Member, 14 Certifying Coordinators, 4 Coordinators in Training and 130 Trainers. 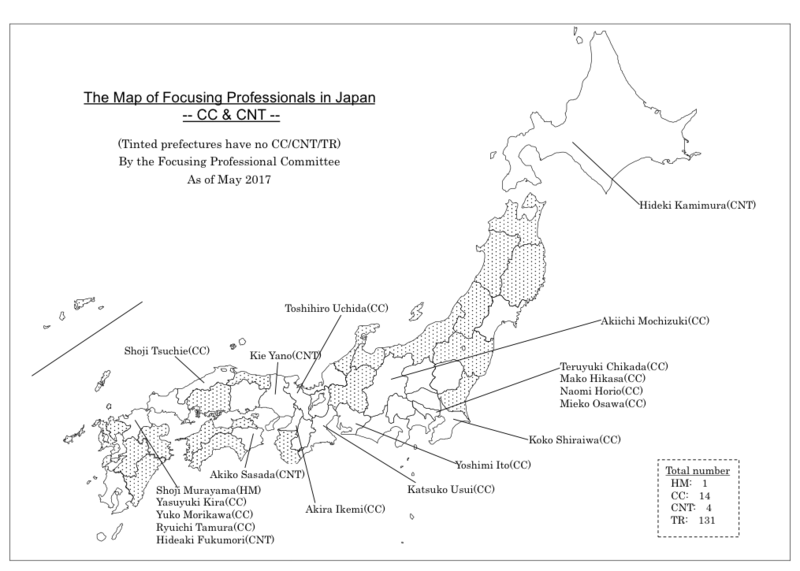 Here is the map of CCs and CNTs in Japan. Hideki Kamimura, TR in 2004, CNT in 2014. Worked as a staff writer at a newspaper company in Hokkaido. Set up Sapporo Focusing Project（SFP）in 2001, taking care of Changes (Practice) group once a month, organizing WSs with many teachers almost twice a year ever since. He wrote MA thesis, “Social Construction by Writing, Recording with Focusing” in 2017. He has been interested in “Writing with the Body”. He is active as a chief editor of the newsletter group of Japan Focusing Association. Teruyuki Chikada, CC in 1998. Mako Hikasa, CC in 1998. Naomi Horio, CNT in 2011, CC in 2014. Nisseiken (Nisseiken, Inc.) is a private psychology services company which started soon after the World War II, and now its office is located near the emperor’s palace in the center of Tokyo. Originally being a reliable psychological testing company, in 1970’s it became one of the centers of Person-Centered Approach practices in eastern Japan and in 1990’s became a center of Focusing which has produced many of Focusing practitioners and professionals. Late Haruo Tsuru started Focusing Seminar at Nisseiken in 1983. In 1988 Focusing seminar by late Takao Murase started and joined by Teruyuki Chikada in 1992 and by Mako Hikasa in 1995. In 1996, Chikada and Hikasa succeeded Murase’s seminar and expanded it into two level courses, Focusing Basic course and Advanced course. Later they have further expanded into many more levels and varieties. From these courses many Focusing communities, Japanese version of “Changes” group, which are the meeting place for Focusing practice, are created and became nests for expanding Focusing activities. Chikada and Hikasa, along with fellow Focusing trainers, have taught in many Focusing workshops for different professional organizations and made Focusing a stable item in training seminars for helping professionals in Kanto area. 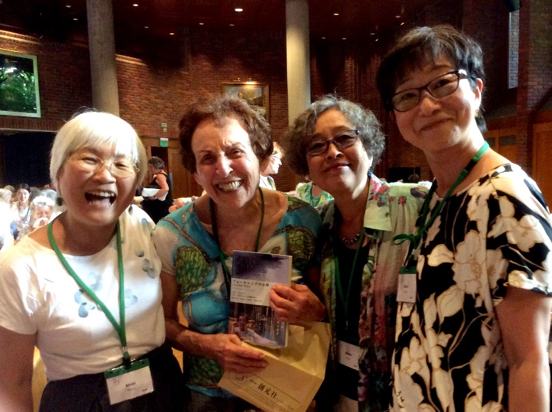 Hikasa invited many Focusing teachers from aboard, translated their books into Japanese, and encouraged Japanese Focusers to attend the International Focusing conferences. With those activities, she bridged Japanese Focusers to the world-wide Focusing community. Nisseiken Focusing courses have produced quite a few Focusing groups which eagerly practiced Interactive Focusing or Wholebody Focusing. Some of the students have become internationally active teachers in those fields. Naomi Horio was one of those students at Nisseiken seminars. She has been very active in promoting Focusing by organizing many workshops featuring both nationally and internationally renowned Focusing teachers, keeping Focusing communities, teaching Focusing both in private sessions and as a workshop teacher for different institutions, including psychotherapist training at graduate schools. She has been a key manager for Focusing courses in Nisseiken, working with Hikasa since 2011, and replaced Hikasa in 2015. Currently she is the president of Japan Focusing Association. Mieko Osawa, TR in 1993, CC in 1998. Worked as a counselor at a University in Tokyo. Set up Focusing Project in 1994, organizing workshops of Focusing & Listening and WSs for Ann Weiser Cornell and other teachers, giving private sessions and trainings. She has been interested in teaching “Listening with Whole Body”. She often attended workshops with Gendlin in Chicago and Ann Weiser Cornell in USA and Europe and participated many Focusing International Conferences. She is active as a member of the international group of Japan Focusing Association. Koko Shiraiwa, TR in 1998, CC. Logo-therapy of Viktor E. Frankl and Client-Centered Therapy of Carl R. Rogers which I learned from Fujio Tomoda has been my background as a psychotherapist. When I encountered the Experiencing theory by Gendlin in 1978 through his lectures and demonstrations, I was moved by the fact that what Tomoda taught us was the concept of felt sense. In 1980, Heizo Iwaya, Reiko Kawamura, Sumiko Inoue and myself organized Tokyo Focusing Institute and gave Focusing workshops for 10 years. We established the introductory style of bodywork named as Karada-hogushi, and published newsletters and the booklet of 10-year history of the institute. In 1990, I personally started Holistic Psychology Institute to convey Focusing for helping professionals and provide practice space for Listeners. Akiichi Mochiduki, TR in 2003, CNT in 2010, CC in 2016. Set up Nagano Focusing Project in 2001, Organizing WSs for David Brazier etc. and his own, and giving private sessions and trainings. He has been interested in the Embodied Dream Works and Embodied Imaginations by Robert Bosnak. He worked as a clinical psychologist at a hospital in Nakano City for 32 years and recently he works Private Practice. Yoshimi Ito, TR in 1993, CC in 2000. When I was a graduate student of Nagoya University in October,1978, I encountered Dr. Gendlin’s special lecture “Experiential Therapy” and happily could participate Focusing Workshop by Gendlin and Mary Hendricks for the first time. Since then I have been working on research and practice of Focusing. I had a chance to study under Prof. Gendlin at University of Chicago from1993 to 1994 as a visiting professor. I got Ph. D in 1998 from Nagoya University by a study about Clearing a Space of Focusing. We have been giving Nagara-River Focusing Workshop for a long time, and I have been supervising Nagoya Focusing Community (NFC) for 18 years. At present, I’m hoping to build up Self-Help Focusing (SHF). Katsuko Usui, TR in 1998, CC in 2015. Akira Ikemi, Ph.D. TR, CO. Professor, Kansai University Graduate School of Psychology. Back in 1980, as I recall, Doralee Grindler had arranged the first Focusing Training Program at Professor Eugene Gendlin’s office at the University of Chicago. I attended this program, as I was a graduate student studying with Professor Gendlin at that time. It was the year after the first edition of the book Focusing came out from Everest House. There were no certificates at the time, so I cannot give the exact date when I completed this program. Around 1995, sometime before or after the Great Hanshin Earthquake, Gene (Gendlin) had recommended me to become a Focusing Coordinator. Again, there are no certificates for coordinators, so I cannot recall when it was, that I was appointed as a coordinator. In college, I was a psychology and philosophy double major, so I got enchanted with Gene’s philosophy and psychotherapy theory, and I have taught people to hold fast to and think freshly from experiencing, in my clinical work, university and graduate school teachings, and workshops. I have taught at universities in not only Japan but in the UK and Belgium. I have presented workshops in Japan, USA, UK, Canada, Belgium, Germany, Greece, Italy, China and Hong Kong and Australia is my next destination. I’ve written many books and journal articles in Japanese and English, as well as DVDs in English and Japanese. My most recent book and article is now being translated into Chinese from Japanese and English. Learned Focusing from Shoji Murayama at Kyushu University and is now a professor at Kyoto University of Education, teaching graduate students who are willing to be teachers and clinical psychologists, and teaching Focusing practice as listening training for them. He is offering Kyoto Focusing Experiencing Room, trying to spread Focusing and training listeners in Kyoto area. He is interested in Focusing-Oriented Psychotherapy, especially clinical application of clients with trauma. He is a representative of Shimane Focusing Project, has practice groups and training groups in Shimane. He is a clinical psychologist and works as a school counselor. He is also an Indian government’s certified yoga teacher and a monk of Jodo Buddhism. He developed the inner weather picture therapy and Focusing Sangha which is group focusing method. Akiko Sasada, TR in 1998, CNT in 2010. She is a staff of Focusing Project since 1994, has a practice group and a training group in Tokushima. She is a school counselor of junior high schools and teaching focusing at a college. She is a member of JCFA (Japan Child Focusing Association). Focusers in Tokushima have been gathering for many years. Shoji Murayama, HM (Honorary Member). Looking Back of my 2 small contributions to the beginning stage of the development of Experiencing & Focusing in Japan. In 1978, I had a lucky chance to invite Gene Gendlin as a key note speaker for the 42 annual Conference of Japan Psychology Association at Kyushu University and he gave workshops in Fukuoka, Kyoto, Tokyo with Mary Hendricks. Since then, this practical focusing seed has been spreading, growing and blooming in Japan. Second, from Kyushu University, many CC and TR members and related therapists are grown up. They are Kira Yasuyuki, Tamura Ryuichi, Uchida Toshihiro, Morikawa Yuko, Fukumori Hideaki, Masui Takeshi, Tajima Seiichi, Ohishi Eiji. Now they are developing their own way of helping. He had learned Focusing at Kyushu University under Shoji Murayama as a graduate student, and has been practicing counseling and psychotherapy based on the Experiencing theory. Meanwhile he realized that it was meaningful for the therapist to focus on his or her own implicit feeling at his practice and to be aware of its meaning explicitly. He has been practicing this method, named as “Therapist Focusing”. He and his colleague published a chapter about this method on a book as follows. Kira,Y & Fukumori,H. Chap.8 The Significance of Focusing for the Therapist: Therapist focusing. Mikuni,M.(Ed. ), The Person-Centered Approach in Japan: Blending a Western approach with Japanese culture. PCCS Books Ltd. Monmouth, UK. 131-145. 2015. Yuko Morikawa, TR in 1998, CC in 2015. Ryuichi Tamura, TR, CC in 1998. He learned Focusing from Shoji Murayama at Kyushu University. He served as the president of Japan Focusing Association from November 2012 to March 2016. He is interested in research on Focusing-oriented dream work. He is a professor at Fukuoka University teaching counseling and psychotherapy. Hideaki Fukumori, TR in 1998, CNT.